October's birthstone is one of the most interesting gemstones on earth. In celebration of the magical and mysterious opal, let’s take a look at some fascinating and rare facts about the origin and value of opals. The first opals are believed to have been found in Ethiopia about 4,000 BC. The ancient Romans called the opal “Cupid Paederos,” which translates to “a child beautiful as love.” The ancient Romans would grind up and consume opals because they believed they had healing properties and the power to ward off bad dreams. The term opal is derived from the Sanskrit term “upala,” which means precious or valuable stone and the root for the Greek term “opallios,” which translates to “color change.” Opals are created from an ancient mineral known as petrified silica gel that is found near the earth’s surface where geothermal hot springs once existed. Today, about 97 percent of the world’s opals come from Australia. The first Australian discovery of common opals was made in 1849 near Angaston, South Australia by a German immigrant named Johannes Menge. The indigenous people of Australia call the opal “the fire in the desert.” Most of the world’s supply of precious opals comes from the Coober Pedy and Andamooka fields in South Australia. Coober Pedy is known as “The Opal Capital of the World” because 51 percent of the world’s supply of opals is mined there. Opals may come from other planets as well. In 2011, scientists discovered opal-like crystals in the Tagish Lake meteorite, which fell to Earth in Canada in 2000. According to a report in the Journal of the American Chemical Society, this was the first extra-terrestrial discovery of these unusual crystals. Some scientists hypothesize that they may have formed in the primordial cloud of dust that produced the sun and planets of our solar system 4.6 billion years ago. All naturally occurring opals fall into one of two classes: precious and common. Precious opals are those that display flashes of iridescent colors when turned and tilted, and light strikes its surface at various angles. This effect is called “play of color,” but is scientifically referred to as opalescence. Play of color, or opalescence, is caused by tiny sphere formations of silicon which make up the structure of opal. When light is refracted by the spheres, it causes light to be separated into its various spectral colors. The actual colors being emitted are controlled by the size and distance of the spheres to each other. While opals come in many diverse colors and combinations, precious black opals are the most valuable and in demand because of their rarity and play of color. Precious opals also come in white, gray, red, orange, yellow, green, blue, magenta, rose, pink, slate, olive, and brown. Reds against black are most rare, while white and greens are the most common. Any opal that does not exhibit “play of color” is classified as a common opal. Common opals are classified as non-gem quality opals. There are several varieties of common opal and most are opaque. Common opals, sometimes called “potch,” are usually colorless or white, but may also come in gray, brown, yellow, or red. 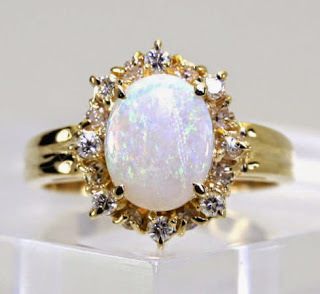 If you're looking for opal jewelry but don't want to pay retail prices, visit Adina’s eBay store where you can rely on the jewelry experts at Adina Jewelers. You'll find fine a vast selection of beautiful opal and other gemstone jewelry and get a buying experience that’s above your expectations.